Service is an integral component of the Storm Lake Saint Mary’s High School, and the high school students learned about military service last week while participating in a unique in-school service project. Sara Maniscalco Robinson assists Elli Jensen with the joint veterans project to record Iowa veterans’ stories for the Library of Congress. 3 Storm Lake St. Mary’s students listen to veterans’ stories and record data for a joint project with the Iowa Veterans’ Perspective and St. Mary’s. Robinson and Kramer drove from Des Moines to Saint Mary’s and set up the school computers with the recorded veterans’ interviews so the students could painstaking record information from the videos for the Library of Congress packets. 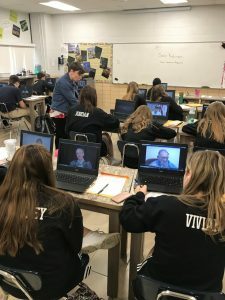 Once the students viewed their veteran’s video and learned some life and military history, they found that the face of a veteran may be different than society may label them, and that veterans are real people. 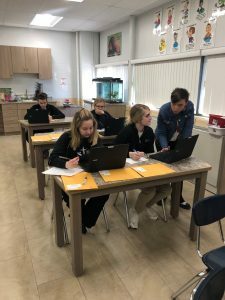 Robinson’s hope was in addition to preserving the veterans’ stories was that the students would also learn history and have a greater appreciation for the military. The St. Mary’s high school students helped finish about 20 packets for the Iowa Veterans’ Perspectives. There are two other Iowa high schools helping with the project before the packets and videos are delivered to the Library of Congress this Wednesday.